Beautiful, elegant and strong timber is at its best when used as the entrance door to a property. Timber front doors provide durability along with high security and its natural characteristics enhance any building. All of our timber doors are of the highest quality coupled with excellent security, durability and performance. Warmlite are able offer a wide range of options and we can manufacture almost any design. Choose from different configurations, fittings, glazing units, insulated timber panels and a wide range of profiles. Our timber front doors can also be matched into our casement range to allow them to be seamlessly coupled. All Warmlite wooden front door installations are covered by our 10 year guarantee. This gives you the peace of mind that in the unlikely event something should go wrong with your wooden front door, you can get them fixed quickly and conveniently at no cost to you. The guarantee covers material defects in profile materials, panels and glass units. 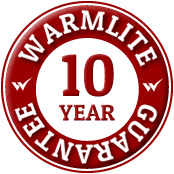 In the very rare event that a problem develops with your timber front door during the ten year period, Warmlite will simply replace the affected product. Multipoint Locking Modern locking hardware is used to provide multipoint locking along the opening face providing excellent security and also supporting the door along its length to prevent movement that can lead to performance issues and reduce the life of the doorset. Warmlite use certified Redwood Woodheart® as standard for our timber front doors. We also have a range of hardwoods and Accoya modified timber to choose from. We can provide dual colour windows and timber front doors with a different colour inside to out or frame to sash. This also allows for the frame and sash to have a different dual colour specification if required. For further information about our timber front doors, a free site survey with a no obligation quotation or to arrange an appointment.